Not every customer path is the same. While general market consumers typically followed the traditional desktop-to-mobile adoption journey, many Hispanics leap-frogged straight to tablets and smart phones. Overall, Hispanics find their smartphone indispensible. They are 28% more likely to own a smartphone than non-Hispanic whites (at 72% penetration). 34% of Hispanics use a tablet and a surprising 72% own more than one device, making the young, uber-connected Latino customer a significant avenue of opportunity for marketers. The bypassing of the desktop computer demonstrates a divide in both buying behavior as well as the differences in what Hispanics and general market consumers view as necessity. The contrast is critical to understanding how and where to market to Hispanics. One of the most important consumer habits of Hispanic shoppers is that they love mobile research but prefer to purchase in store where they can touch and feel a product directly. This means brands can make offers more compelling by supporting it with mobile promotions and providing digital coupons that customers can use directly from their phone at the retail counter. Hispanics are also three times more likely to have Internet access via a mobile device, while having no home Internet (9 percent vs 3 percent, respectively). This disrupts the customer journey and impacts which types of products and services Hispanics will most likely respond to when browsing the Internet. HISPANICS CONSUME ENTERTAINMENT AND KEEP UP WITH TRENDS AND LIFESTYLE ISSUES. Almost 24% of Hispanics follow their favorite brands and companies on social media sites vs. 20% of non Hispanics and they are largely female. In fact, Latina bloggers are 37% more likely than the general market to publish a blog on a blogging platform or a social networking site. And 72% of the influencers active in blogging are doing it in English. Almost 24% of Hispanics also indicate that social sharing provides them an outlet to share information about companies and products they like vs. 20.2% of the general population. 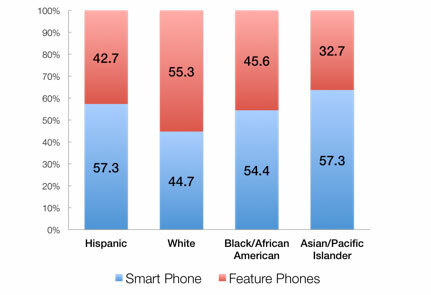 Hispanics are heavy smart phone users with 75% of Latinos accessing the web via phone compared with 60% of Whites. * (*2013 e-marketer) According to a recent Neilson Research study Hispanics own smart phones more than any other group, they have more apps, shop more and watch more video (62%). Facebook is the fourth most popular website among Hispanics, reaching nearly 82% of the entire online demographic. 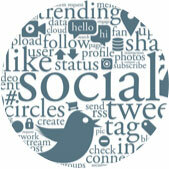 Brands are finding social media a necessary way to reach customers quickly with offers and coupons through social media sites like Facebook, Twitter and YouTube.